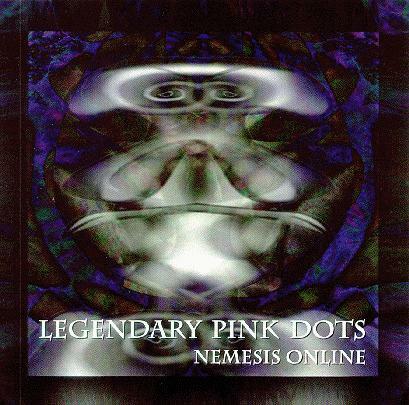 The Legendary Pink Dots, "Nemesis Online"
Vinyl edition limited to 1998 copies. The bonus tracks on the vinyl ("10th Shade" and "Schatten") were recorded by Edward and Phil after the completion of the rest of the album. 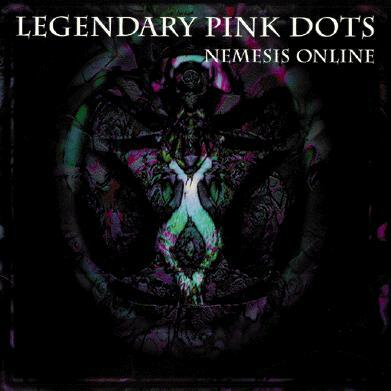 The working title for this album was ZEITGEIST. It's December 31, 1999...five minutes to midnight. Five minutes to the big one; an occasion to be marked in some way, remembered, related to the grandchildren in the years to come. The trouble is that I'm not a party animal. Give me a red nose, a glass of tequila, an armchair, and I'll be happy to watch the festivities on TV. The trouble is that they cut the power off in August. My needs are simple. As long as I have enough to eat, a little to drink, a reliable supply of cigarettes, a warm room, a decent book, and a TV, I'm happy. The trouble is that they cut the power off in August. It was like this...A rumor persisted that all the computers in all the world were set to go berserk as the clock chimed for the twelfth time on this very night. People panicked and withdrew all of their money from the banks in July. She's writhing on the floor. O.K. It doesn't rhyme, but at least it's ours. Driving the pack, from the rear, with a trumpet, with an axe. Driving to the precipice, windswept and wet with starving neglect. Eternally carving my cause on a landscape that's blighted and scorched. I'm blighted and scorched with the truth, we don't listen, we shoot, from the blindside. It's a landslide, but in hindsight, I thought it was easier. But it's all much too late to turn back, I must face an eternally fateless way in a place where my orders echo my torturous ghosts. In a space with no windows, I'm counting the touch. All this time to reflect on my crimes to humanity. I'm screaming profanities, just give me a chance to start over again. I confess, yes, I'll do it again. There's a riot in the cell block... bugs are sliding down the phone. Mutating sores and spores and shellshock-virus Martha hunts alone. We're wearing spacesuits on the subway. We take our pleasures from a screen. Care you for something intravenous? Go ahead! I'll plug you in ... Christ I need a cigarette but there's no door etched on this glass. You see, these standard regulation suits are cheap - they have no class. I'd like to ride a horse through Utah blowing smoke rings five miles wide, but they cordoned off the airport and I cannot get a ride. "Get a life!" you say. I'm trying. I'm insured up to my neck, and if the whole world just capsizes, just be sure I'll collect. And if I want to visit Venus all I have to do is click. You see, this mad chaotic universe is at my fingertips. And one day I will bring you discipline. I'll save you with this disc. Like me it is incorruptible. Like me, it takes no risks. Blood on the door, blood on the stairs, blood on the floor, blood in my hair, turn around and white light guides me twist and fall and kneel beside me nothing is sure, visions impair, I'm sick to the core, and walking on air Nothing is real, no one to hold, nothing to feel except for the cold. Your white eyes, they never judge me, they just fix upon a place that's far away, deep inside you, and I wonder will I ever have the chance to walk there too? But you're tongue-tied, you always have been. Our conversations, they have been far too few. No going back now, at least we have the time now to explore what's happening deep down inside you, what's going on here inside me too. We're not dock-tied, we're individuals, and angel, all I asked was "set me free". But not this free. Johnny with the roving eyes sits bored upon the riverside, as Juliet, his future bride, jumps naked in the water. Figure eights and scuba dives, deep down she's blowing suicide. She squeaks and metamorphosizes movie stars and slaughters. Johnny's staying serious, his face is kind of frozen, one eye is completely closed, and one eye is wide open. It swivels from a sunset to a swan. It weeps for every goddamn thing that's wrong. When Johnny's holding Juliet, it's like I hold my cigarette. I squeeze it, choosing to forget the warning on the carton. I flick it from the window ledge and stuff it on the waterbed. The black smoke rises overhead, then settles over London. I am staying serious, my face is kind of frozen. One eye is completely closed, and one eye's staying open. It swivels from a sunset to a swan. It weeps for every goddamn thing that's wrong. When Johnny's holding Juliet, it's like he holds his cigarette. He hangs her from the window ledge, and blows her over London. She'd pick a star and pirouette, she'll turn a cartwheel on my head. I grit my teeth, put up with it, because it's all for fun. The phone rings... 3 A.M. I'm pretending I'm asleep - could hear you creeping .. And laughing as you dropped my name like bleeding snakes, like poison, like the hell-fire that you paint in vivid colours. Well I guess that he's a saint while I'm the one that's in the way. The one that keeps you tangled up in chains. So very much I have to say.. I can't make it. Well, it was only yesterday when you told me that you loved me. Will you write it? I need to see it - black and white. I'll read it. I will read it once again and maybe one day I'll believe it. But will you tell me where you've been - everything in detail, every second, every moment. Every thought. I need to know. It's just because I love you. Well, isn't that enough? No pets allowed! No pets allowed! That's what the placard said so they left us out her floating upside down, our ankles bound. Protective coating, cos we're very cute - but sinters here don't hesitate. They shoot! (It's raining crocodiles). And I really want to sleep with you but cannot stand them watching. They encourage us outside the glass - throw barbie dolls and stockings. Oh, but I'll retain my dignity and gaze up at the moon until my buddies come and rescue me. We will rise! We will find a place that's just for us. Lined up between the arrows at your heart - is this a charmed life that I lead? Now could it be that some place. Some time, you will stop believing and things that once were charming will feel like sand against your eyes? When I walk into your space, you'll see a thief by night. To send away or lock away or run away from... Will there come a day? Will we have the courage just to walk away while something still remains? Will we keep it pure? Now let this death be noble. Let this death be grand. Don't keep it on a lead... When I think of you I want to see you on a summer day. My treasure. My lover. Together. Alone. Jello man cuts comers, creeps unseen between the sheets. When you're asleep, he creeps inside you. He's sinking in his teeth. He's breaking legs! He's laying eggs... you should see him play the organ. He whistles "Dixie" no your pipes, and you (?) - you simply die of fright. He slithers clean away and not one single soul survives. Now I'm starving in my shrinkwrap. I'm lying in the road. I know he won't get me, because I will live forever! Can't stand this cage cos there's no place to fly to. My future's been cancelled, my past's just a lie. You say, "Do it alone", and I'm trying like hell to rise up from the ashes, be somebody else. I shout my rage from the rooftops, burn down this shell, but you smile from the gallery, ringing a bell. And I jump, and I've jumped but the bars are still there. I know deep inside me you don't really care. You say, "Sleep baby. Sleep. It's all just a dream."